Kaal Bhairava is lionized in honour of the Jehovah of Time, Lord Shiva. Also celebrated as Kalashtami, it is the most expedient day devoted to Lord Shiva, and is observed on the eighth day postliminary to the full moon, as per the traditional Hindu calendar. To have a bite of this extensive, detail rich affair involving the “Incarnations”, “rituals” & the “legendary ethos” surrounding this felicitous day, think no more & just read on. Kaal Bhairav conjured the holy grail of time for all the galaxies. He rules the universe and controls time. He is venerated by the people to transmute the bad times into good. He helps by guiding them how to organize their time in the best possible way. 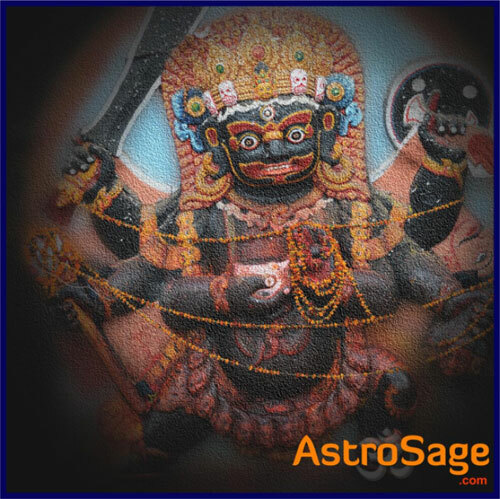 Generally, the 8th day of the waning moon within every month is an opportune time to pay homage to Kala Bhairava. Kala Bhairava is known as Kshetrapal or Kshetrapalaka, meaning the keeper of the temple. As an honor to the Lord, the keys of the temple are submitted to him at the time of closing and similarly, received from him at the time of opening. What does the Legend (fox) say ….. According to the Legend, on this day Lord Shiva in the avatar of Mahakaleshwar, minced off Brahma’s fifth head and performed penance. When it comes to why he did this, there are several mythos. According to one such folk tale the Trimurti, Brahma, Vishnu and Shiva had an argument over the reason - who is the most powerful. During that argument, Brahma made a remark which infuriated Lord Shiva. He conjured Bhairava, from his body (hair to be precise) and ordered him to bring Brahma’s head to the block. On this day, devotees of Shiva should get up early, take a bath and offer prayers. Tarpan is performed and dead ancestors are remembered as well as honored. As Kal Bhairava mounts a black dog, therefore people feed dogs on this day. Worshipping Lord Bhairav brings consensus and tranquility in the family, maintains health and rebuffs all your troubles. One can get respite from all problems by reading Kaal Bhairav Stotra, Bhairav Tantrokta, Batuk Bhairav Brahma Kawach and Batuk Bhairav Kawach. We at Astrosage wish you a very promising Kaal Bhairava Jayanti & we hope that this article was as edifying as it was informative. Have a great one !!!!! !